The update to biteSMS now allows you to the app as your default SMS app…very cool. Another cool new feature of the update is when you have a missed/unread text and you open biteSMS, it will open directly to the conversation with the missed text. Below is the full change log and screenshots. – If ON, when clicking to Reply to an incoming SMS alert, you’ll be taken into biteSMS instead of the Apple SMS application. – If ON, the badge that denotes how many SMS’s are unread will be shown against the biteSMS icon instead of the Apple SMS icon. 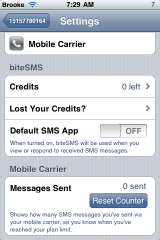 – ON or OFF, incoming SMS messages containing biteSMS credits are handled in a more user friendly fashion. • Fixed the issue, whereby if an error was displayed during the sending of an SMS, then it would exit back to the Home screen. • Improved matching of incoming SMS numbers against Contacts. 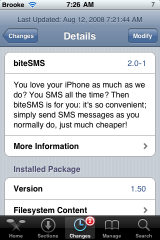 • For an unread SMS, upon starting biteSMS you will be taken directly to this SMS conversation (just like the Apple SMS app). I really want to install this, but think I might hold off a little while. I installed the update last night, and it killed my phone. Had to restore it.. Anyone else have any issues? Installed 2.0 and had to restore. Problem was something with faulty permissions. Now with this version 2.0-1 all works well, so no worry. What about forwarding SMS? Is it included? Love this one, it allows for message forwarding. just swipe the message to the right and you get option to delete, forward or cancel. Now all I need is the MMS application. Hola !! instale el BiteSms y trato de desinstalarlo, pero no me parece en el unistall del installer, como puedo borrarlo de mi iphone? wait i have a question, can i only send sms through smsbite? or can i recieve sms through bitesms? because here is states incoming and outgoing sms cost the same. plz tell me before i purshase it. You can download it from Cydia and you only purchase Credits but you can use it as your default SMS application, it allows both sending and receiving SMS and forwarding messages as wel (just swipe the actual message you want to send to the right for delete, forward or cancel to appear). there’s a setting: send texts via your carrier. there’s also a counter, so you see when you have reached your limit. you can reset the counter any time (i do it every month). How do you forward your message? How is this app free?? I mean I get that you aren’t forced to buy credits.. But don’t you still have to pay the $5.95 to get a license that doesn’t expire?? @ Joey, BiteSMS WAS free but is no longer free…..I’m facing with the issue, to buy or not to buy…..
Will bitesms work with iPad 3G?